I am a firm believer in the importance of the arts in children’s lives. That is perhaps readily recognizable through the tagline of my blog, “Writing, Reading, the Arts, and Life.” For me, those four things are inextricably entwined. Drama, dance, music, the visual arts – they all have the capacity to enhance a child’s self-esteem. They also have the capacity to enhance a child’s appreciation of and understanding of the written and spoken word. There’s no need for people to protest that they’re not trained singers, actors, dancers or artists. This is not an audition, it’s an opportunity to connect with a child in a simple, no-pressure way. (Honest!) Here are a few ideas. What child doesn’t love to pretend? From the time they’re tiny, children try out different roles, one moment being a mommy or daddy, the next moment being a butterfly. This can be encouraged during story time by asking them to show how Papa Bear acts and sounds, or what the Wild Things do. Or use puppets, or dolls (or bears, or trucks and cars, whatever works!) — or as the child in the feature image for this post did, draw your own people and theatre — and perform the story as if it were a play. Children respond to music from the time they’re born – even before. Lullabies; Twinkle, Twinkle, Little Star; even the simple A, B, C, D, E, F, G song; these are easily accessible to just about anyone. If you can’t sing, (and even if you can) there are countless CDs of songs for children. My mother’s family is very musical, and there’s a traditional family lullaby that was sung to every baby. One aunt who married into this lullaby-singing family was startled by the tune that By-o By-o is sung to, saying, “That’s the hymn ‘Come Ye Sinners Poor and Wretched’!” Maybe so, it doesn’t really matter. What mattered was that it was a softly soothing tune that could easily have words strung along the notes. My mother used to croon made-up-on-the-spot stories to me as she sang me to sleep – “We will go to Grandma’s tomorrow and we will have a cup of tea.” Yes, that is story, and that is song, and that is a connection to both that is treasured. EDITED TO ADD: In the comments below, Erik of This Kid Reviews Books mentioned that he’d be reviewing a book about the arts for Perfect Picture Book Friday. His post is an excellent addition to this discussion, as it shows so well the synergy between books and the arts. Thanks, Erik! To read his post, click here. 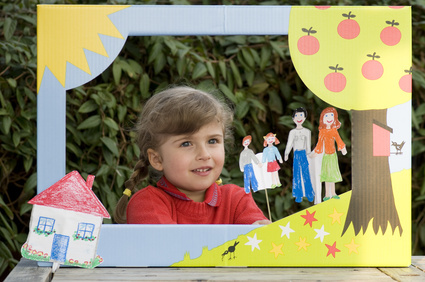 With paints or markers or crayons or playdough, children can illustrate stories that are read to them – or they can even dictate or write their own stories and illustrate those. A book like Dragon Dancing which I reviewed last Friday shows how children took an idea heard in a book read to them by their teacher and created an art project with it which led to fabulous creative play and their own interpretation of a Dragon Dance. All these things give “added value” to the practice of reading to and with children. But don’t just take my word for it. Emma Walton Hamilton (In the Spotlight this week) and her mother, Julie Andrews Edwards, have something to say about the arts and literacy (and writing) as well. Or, to see the full interview all in one (but without the background information) you can go to the Adolescent Literacy upload on YouTube. Blogging is a conversation, and I love to hear your ideas. What are other ways the arts can be used to enhance the reading experience for children? I have TWO copies of Raising Bookworms available to give away, and there are two things you can do to make yourself eligible to be part of the draw I’ll hold next Monday, January 30, 2012. Each time you do one of these, your name will be added to the entrants’ list, and on Monday, random.org will help me select two winners. So the more times you participate, the more chances you have to win. Leave a comment, mentioning something that particularly resonated with you in the post, on any (or all!) of my blog posts from today up to and including Friday of this week. Write a post about literacy on your own blog, and link back to this post. Be sure to let me know, so that I can read your post, and so that I put your name on the entrants’ list. Either of these will enter you in the draw for one of the two available copies of Raising Bookworms. Doing more will enter you more times (for instance, if you read and comment on all the posts this week, you’ll be entered that many times). (Note: you’ll only be able to win one copy — once your name is drawn, it will be removed from the second draw, to give others a chance.) Through it all, we’re all supporting the cause of getting kids reading, and getting books into kids’ hands. If you want to do something concrete to get books into kids’ hands (although this won’t affect your entries into the giveaway) I’d urge you to go to We Give Books (http://www.wegivebooks.org), sign up (it’s FREE), and read one of their ebook picture books. Simply by doing that, you will have enabled them to donate a book to a child who wouldn’t otherwise have access to books. My Chipmunk and I have mostly interacted with the You Read to Me, I Read to You books. However, I haven’t exactly encouraged her to act out a scene. I think that could make some of our weekend story time sessions that much more enjoyable. That’s a great idea. Thank you for sharing this. Thanks, Angela — I hope that your Chipmunk enjoys the acting! Lovely and meaningful post Beth. I enjoyed your suggestions of how to incorporate the arts into a child’s daily life and reading life. And, I sat and watched the complete video you shared of Emma and Julie. It is a very important piece for authors to listen to as they offer much wisdom about how reading and writing is such an expressive art form that incorporates rhythm, music and voice. I began acting out characters in books with kids when I was babysitting. We made up stories at bedtimes and acted them out. I continued to do this with my daughter, because it was a silly way to have fun. We used to drive my husband crazy, because we would sing our conversations to each other (rather than talk) as if we were in an opera. I always wanted her to be exposed to the arts because it was my life as a young child and teen. We are very fortunate to have a theatrical series at the Victoria Theater for children, where they are exposed to a variety forms of art, from musicals, bands of everyday kitchen instruments, dance, puppetry, plays, and short musicals. Again, thank you for the wonderful post. I really enjoyed today’s theme. Thank you, Pat. Your comment has added so much to the post. I love that you and your daughter used to sing your conversations to each other! I am very grateful that you watched the complete video of Emma and Julie. They are so articulate and thoughtful. What a coincedence! The picture book (not telling!) I have for tomorrow is conected to the Arts! I think it is important for parents to do the Ars with their child(ren). Great post! Thanks, Erik! Great coincidence — I can hardly wait to find out what book you’re doing tomorrow! We too (like Pat) use singing our words when we speak with the kids at times – it is a great technique when talking about ‘worry thoughts’ to take the catastrophe out of it…An anxious worry thought really loses it’s power when singing it to the tune of ‘happy birthday’ !! Thank you for sharing these ideas they are great!!! Thank you! It certainly worked with me — my mother taught me to love both music and the music in words. That has stayed with me all my life.